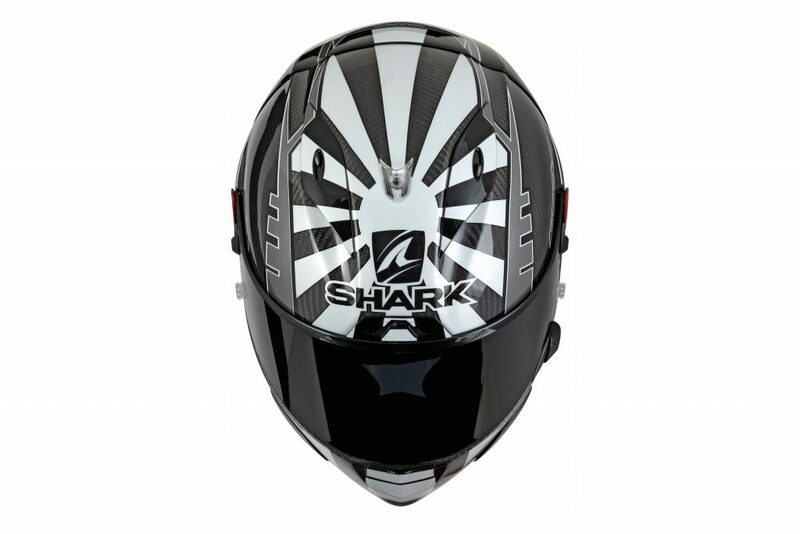 This helmet comes with a standard ECE certification and has successfully passed all tests of the FIM Helmet Standard FRHPhe-01, namely linear impact tests at high (8.2 m/s) and low (5.0 m/s) speed on ECE points, medium speed linear impact tests on three extra points randomly chosen on the helmet surface, oblique impact tests with five different orientations and penetration test at two random spots. 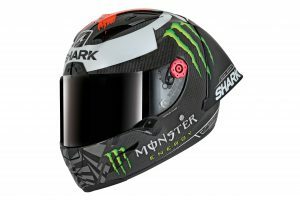 The helmet will be available for the riders in five sizes (from XS to XL) and the homologation is valid only in the presence of all the available appendices (chin, top and front vents, top and chin lateral venturis) and the rear aerodynamic spoiler. The FIM Racing Homologation Programme was established in order to grant special recognition to products related to safety and as a requirement for FIM competitions. The main aim of this programme is to meet the need for an advanced evaluation of the safety performance of different kind of products. The homologation is obtained when specific high performance and quality standards set for each product are met. 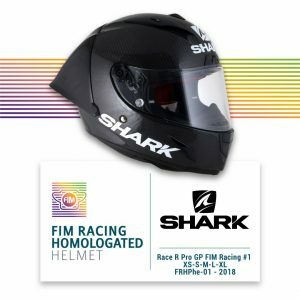 While the Race-R Pro GP FIM Racing #1 is only available to official SHARK sponsored riders competing in FIM competitions, customers are able to purchase the limited edition Race-R Pro GP with the E22-05 homologation. Available in three ‘Winter Test’ replicas versions – including Lorenzo DRS, Zarco DSK and Redding DKR. The Race-R Pro GP has been fitted with an aerodynamic spoiler designed specifically for racing. 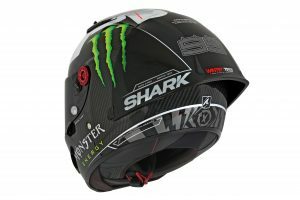 The high-performance profile has been developed through close collaboration between SHARK’s Research & Development teams and MotoGP racers as well as state-of-the-art testing based on Computational Fluid Dynamics (CFD). The ‘Quick Spoiler Safety System’ ejects the spoiler in the event of a fall to limit the effects of secondary shocks. The interior features a two-tone, high-tech ‘Alveotech’ lining fabric with a Sanitized® label which prevents breeding of bacteria. 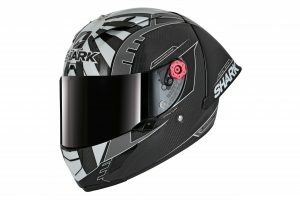 The shell is built with a Carbon On View & Aramid (COVA) structure which is lightweight and resistant to abrasion and compression. The interior of the helmet benefits from new technology used to cut out ‘3D morpho’ cheek contours for maximum comfort. To muffle noise at speed, the helmet contains shape memory ear pads and a dual use anti-fog breath guard. The wrap-around, breathable neck protection also helps with noise protection. 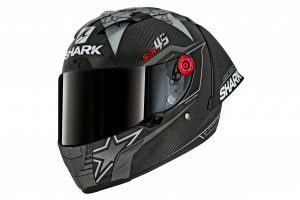 Priced at £869.99, the Race-R Pro GP comes packaged in an official SHARK Racing Division bag used by our MotoGP racers and a dark smoke tinted anti-scratch and anti-fog visor – with an ergonomic visor grip. Available in sizes XS – XL. 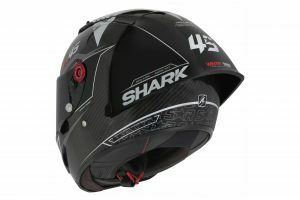 To locate your nearest SHARK Helmets dealer, visit www.nevis.uk.com or call 01425 478936.